Sunny never lets cool weather get between her and a grilled burger. She's firing up the grill indoors today for her Sunny Side Up Burger, served with a crisp salad and Sweet n Smoky Onion Rings. 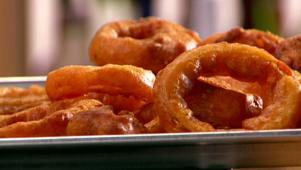 Paprika adds a touch of sweetness and smoke to Sunny's onion rings.